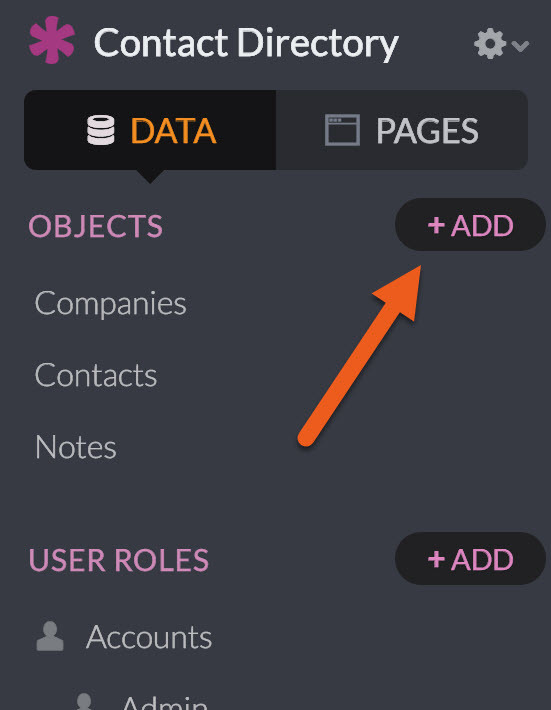 Objects are used to separate your data into common groups. You can think of an object like a spreadsheet or a database table. Fields are used to define specific attributes of an object. Think of a field as a spreadsheet column. 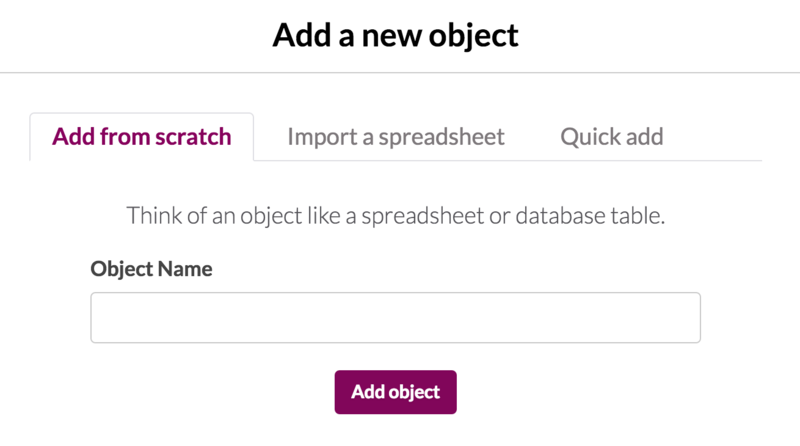 You'll want to add a field for each attribute you want to store for a given object. Your app’s objects are listed on the left. Click an object to access it. Consider your fields. It can help by starting at the bottom. List all the fields your app will need to display and manage, then group them into the most logical collections. These collections are your objects. Think about your pages. If you're adding forms, what inputs will those forms contain? If you want to display a table of records, what will the columns be? Ask yourself if each of the inputs or columns sound like they belong to the same group. If not, you will want to store them in separate objects. Singular or plural? If you have data that can be plural combined with data that is singular, then you may want break up the plural aspects into a separate object. For example, let's say you want to track job applications (single), but each application can have a job history of previous jobs (plural). In this case, it makes sense to make the previous jobs a separate object that would connect to the application object. Do you have repeating data? If you are repeating the same information over and over again in your records, you may want to separate that info into its own object and connect it to your original records instead. This way you will only have to update it once. This will bring up a pop-up to add your object with tabs for 3 options. This means you'll need to add all the object’s fields yourself. 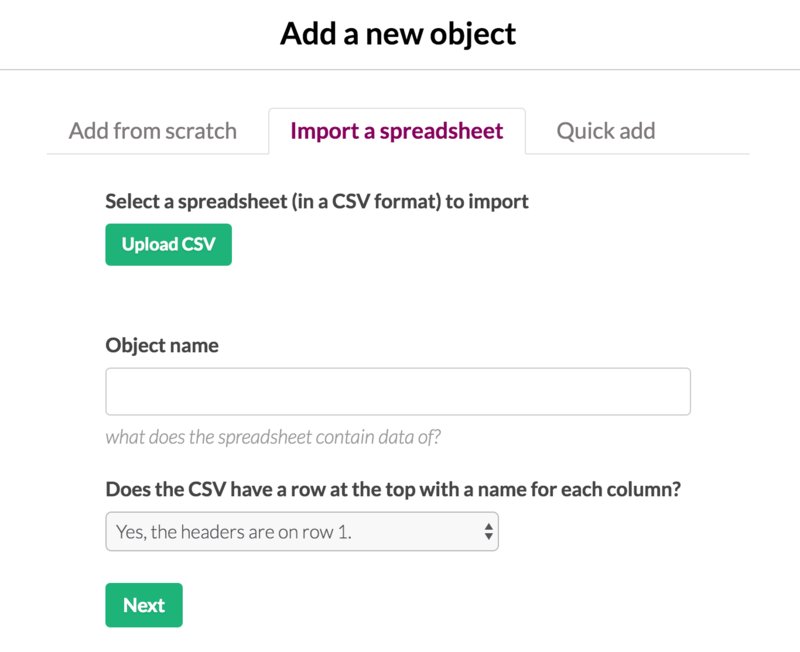 This is the most common way to add an object if you are not starting with an existing spreadsheet. First, give your object a name. We recommend you use the plural version of your object name (e.g. Companies instead of Company). Knack automatically creates a singular version and will use the right version when needed. Click the "Add Object" button and your new object will be saved and added. You can now start adding fields to this new object. A default "Name" field (e.g. Company Name) is added automatically. Knack will create a field for each column in the spreadsheet and import each record into the object. Click here to learn more about importing spreadsheets. 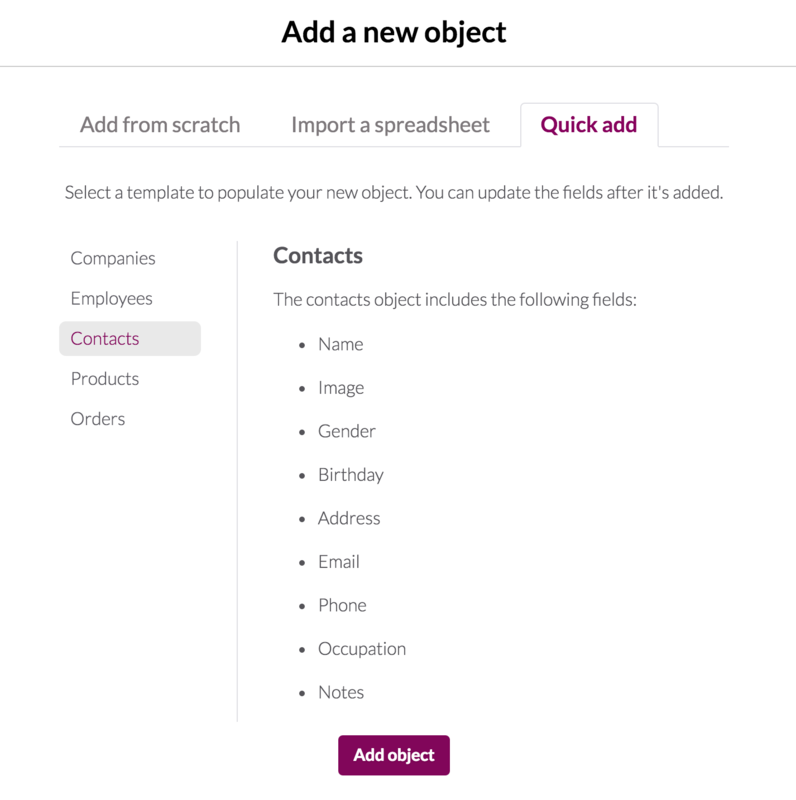 All the fields listed for each template will be added to your new object. You're free to update or delete these fields after the object is added. Set Display Field: The display field is the field that best identifies the record. This field is used throughout the application when only one field is used to display the record. This defaults to the first field in order. Make sure the identifying field is something that is easily recognizable, like a name field. ID or auto increment fields are not usually good options, since you are less likely to know a record by its numerical code. Set Default Sort Order: The default sort order is used to order the records when no other sort order is given. 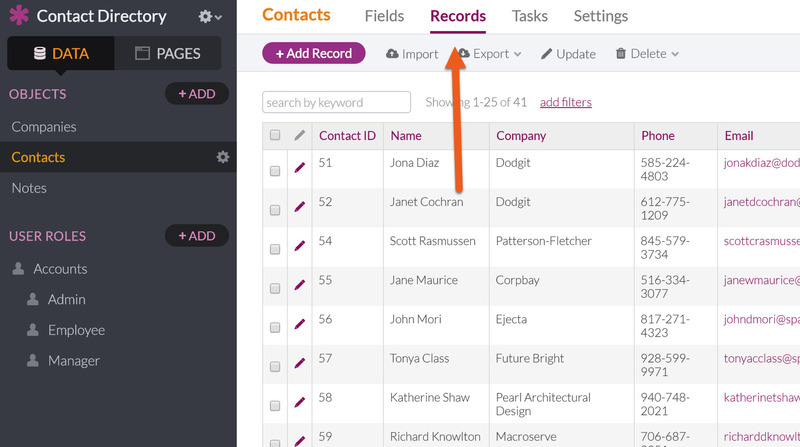 This defaults to the order the record was added, but you can set it to sort by any field. Note: Object sorting preferences to not apply to records displayed in a view in any manner. Sorting on an object only applies to Builder Data record sorting and for dropdowns used with this object in a connection field. 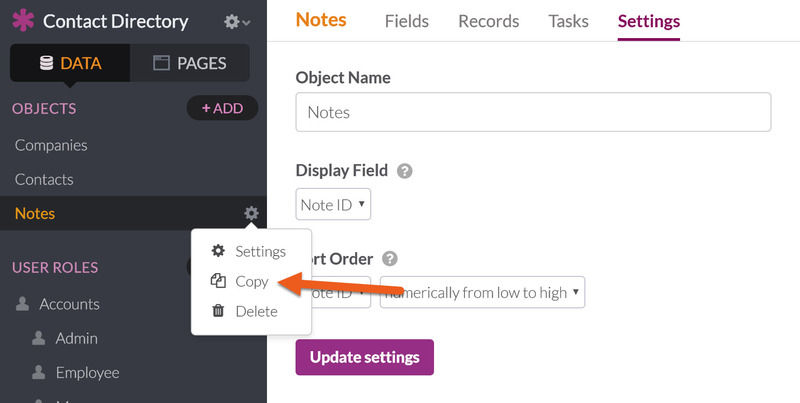 You'll be given the option to copy the fields from that object to a new or existing object. If you choose a new object, you'll be asked to name the new object. If you choose an existing object, you will be asked to select which existing object. 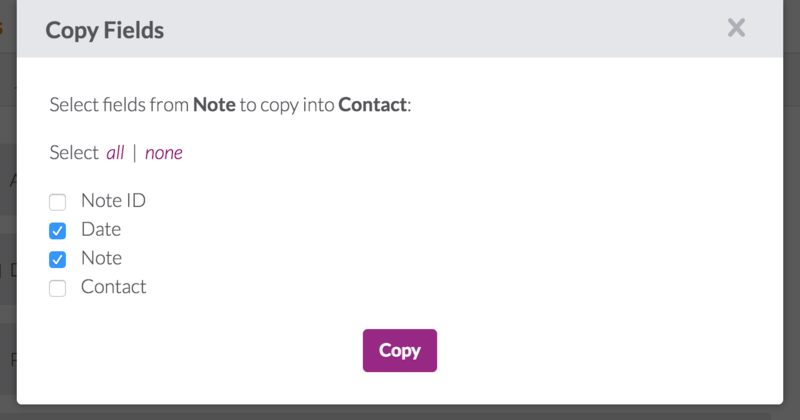 When copying a User Role object to another existing User Role object, be sure to NOT copy the five user required fields: Name, Email, Password, User Status and User Roles. If you do, you will find that you are unable to delete the duplicate fields since they are required. Records on an object are not copied. If the original records are needed on the copied object, an export of the records from the original object in to the copied object will perform this step. These fields can be used like any other field throughout your app. 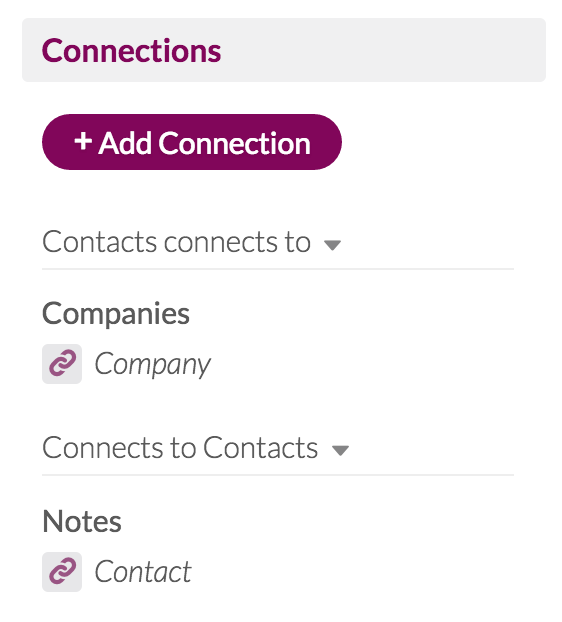 If you add a connection field to a form, it will operate like a "look-up," where you can select a record to connect to from the connected object. Displaying parent-child records in your app’s pages. Running formulas to find the totals and averages of child records. Showing records connected to the logged-in user. Click here to learn more about what is possible using connections. Click here for more on managing records. You'll be asked to confirm this action. Note: Deleting an object is destructive. Deleting an object will remove that object entirely, including any records and wherever it may be used in your live application. So if you have any views displaying records from that object, those views will be removed as well.